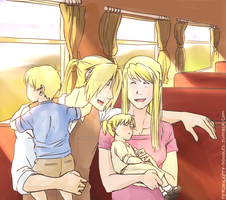 Ed and Winry's daughter when she's older. I don’t know what Ed and Winry would name their kids canonically, but I’ve just been calling her Sara. Your art style is very interesting and seems familiar. The contrast in the picture to make the lightning glow is awesome!